The SSR will replace the coffee thermostat, so that the boiler can be proportionally controlled, based on temperature measurements taken by the Pi. The model used in this project is the Fotek SSR-25 DA (pictured below). It’s rated for 25A load and operating voltage of 24~380V AC. 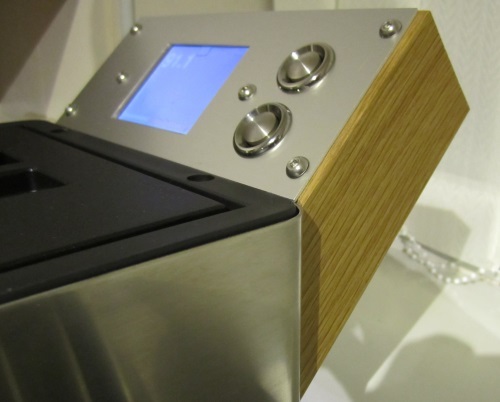 The TFT display looks like in the ZPM Nocturn espresso machine. James, slightly off topic PID stuff way over my head🤗. Have you considered plumbing in the water feed therefore excluding the tank. Is it feasible given the components and design of the Classic pee 2015. My first thoughts are that you would need a one way check valve at the water mains (as a courtesy to ensure you don’t pump overflow from the boiler back into the public water mains!) Then you would need a solenoid valve, to shut off the mains water supply when the pump isn’t running. You could wire this to the pump, so that the valve opens only when the pump is active. The input pipework on the pump is a low pressure push fitting (barbed connector), so you would need to secure this more firmly to cope with mains water pressure. It looks like UK mains water pressure is statutory minimum of 0.7 bar (www.ofwat.gov.uk), so I guess the incoming pressure is unlikely to be much more than 1 bar, and could be a lot lower. Obviously, the pump normally pulls water from the tank, rather than having its input under pressure, so I’m not sure how this would work with the EP5 pump (Ulka may have some datasheets or application notes on this). There is also the OPV (over pressure valve) to consider. This is used to limit pressure to around 9 bar (depends on how you set it). It normally vents its output back to the tank. I’ve successfully looped it back to the input of the pump in my own setup. If the OPV output was connected with a T piece to the pump input and mains input, it would obviously be fighting against mains water pressure. However, the 9 bar pressure from the OPV should overcome this, and the OPV should act as a check valve to prevent mains water seeping back through the OPV. The OPV setting might need tweaking, as you have both the spring and mains water pressure acting to keep it shut. In short, I think it may be possible to make this work. Obviously this is not something I’ve ever tried, and it would need a bit of experimentation to see if it works. Have you done any further work on this? I have a Rancilio Silvia I am modding, and may end up using some of your source. Would need to re-work the temperature input to use an ADC, as I already have an internal type T TC, that I would like to continue using. Modifying the temperature input to use ADC should be very easy. Just modify the Temperature::getDegrees function to return the value from your sensor in degrees, and that should be the only change needed I reckon. Drop me a line if I can be of any help! Regards, James. First of all Many thanks for this very Good Blog post. I have also a Gaggia Classic and I have installed now also a microcontroller (arduino mega) with same Flowmeter like you. Everything works almost perfect. I have two Buttons 30ml and 60ml. My bigger Problem is, When I Start each Programme without the Portafilter I get exact 30 or 60 ml in the Cup. But with grinder coffee and portafilter I Miss 20ml on the 60ml Cup? Do You know why that happened? And Where is the water? I’ve all connect the Tube with t-connector like you. Maybe I’ve forget something. It will very Helpfull When you can may help me. Hi Khalid. If it gives a correct volume without the Portafilter, but a reduced volume when using coffee, I can think of four possible explanations; 1) water passed by the OPV and returning to the tank not being counted (guess we can rule this out, as you’re using a T-piece like me) or 2) water being forced back through the flow-meter to the tank (due to pressure), or 3) some water being absorbed and retained by the coffee grounds, and not reaching the cup, or 4) tank not fully primed and having some air in the system. I’m guessing it could most probably be due to (2) and (3) above. Other things I would suggest to check are that the flow sensor is mounted in the recommended orientation and consider the layout and length of the pipes used, which may have an influence on how it behaves. On mine, I’ve connected the T-piece so that there is “straight flow” from OPV to pump input and the “upright” leg of the T-piece is the intake from the flow-meter. There is also a fairly large loop of pipe between the flow-meter and T-piece in mine. These are just my suggestions of some possible things to look at – hope it helps? I have Gaggia Classic too and AFAIK there is vent that allows some water to run trough bypass tube to drip tray. It usually happens when coffee is ground too fine (or if dummy pod for cleaning is attached). Sorry the same Problem inhave with 30ml programm. When the flowmeter calculate 30 or 60 ml so why in the Cup are less? Another option you might want to consider (found on commercial and hobbyist machines) is to have a “learn mode” so that you can manually pull a shot and the CPU measures the volume dispensed, and stores that for use next time you push the brew button. Awesome project you did great, both on technical choices and quality of craftmanship! I am currently working on a similar project (with some fancy features) on my espresso machine, i gathered much inspiration from your work: thank you! For the temperature, i am using thermocouple K (i have a heat exchanger machine and i plan to put it inside boiler) but it is not giving stable readings. How often do you read temperature? what is your timeslot? I’m not sure i read it right, in regulator.cpp i see m_timeStep = 1, seems you try to have timeslots of 1 seconds (1×10^3ms). Thanks Jacques, pleased you found it useful! I would be very interested to see your project if you write it up! I ended up with a custom temperature probe (using K type) inside my boiler (i have Rocket espresso Hx) and using Perl script with 0,5s update interval because i’m curious of temperature profile, works pretty fine and very accurate to temperature fluctuations. I now need to integrate the SSD control with PID software to control the boiler, a major step but with help of your blog it really makes it easier, thanks again! It sounds like you are making great progress! Thanks for the update, I was curious to know how you were getting on. The responsiveness must be really good with the probe in the boiler. The PID regulates quite well the temperature, it is overall very reactive and i have almost no temperature “overshot” (+0,5°C max to the target temp). Thanks again for your blog and your really well documented code, i don’t think i would have been able to achieve this otherwise. Awsome Job my friend and great presentation. I have a gaggia baby that Im thinking to mod following your example, but I have never before worked with rasberry nor arduino projects at all. Do you think that its good idea to proceed ? Maybe you could help a little during the hole project? I’ll drop you a separate e-mail, and will be happy to help with questions. The main purpose would be as a temperature control for correcting the temperature and in addition a water flow meter in order to stop the water after a certain water amount passes (30 or 60ml) the basket. 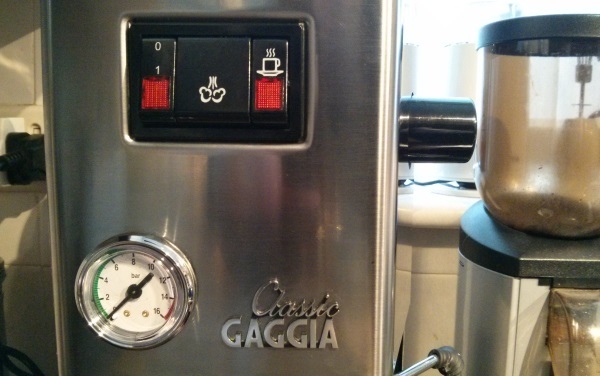 Pressure will be measured by an individual manometer at the base of the gaggia. Thank you for describing your project in detail. I like it very much and would like to adapt parts of it for my Rancilio Silvia. 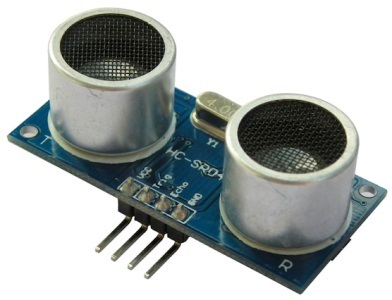 You described that you replaced the DS18B20 with the TSIC 306 temperature sensor. In the data sheet I read that a capacitor (100nF) should be placed between V+ and GND? (“Recommended as close to TSic V+ and GND-Pins as possible”) . I would like to know if you use a capacitor and where you did place it. I didn’t use the 100nF decoupling capacitor, and it works reliably without the capacitor for me. It is recommended by the manufacturer, so probably better to include if possible, though certainly not essential. Fantastic project! Really well done. I am currently using your project as a guide for my Silvia mods. I’m not particularly au fait with this kind of thing so I’d appreciate your confirmation and a fix if you have one. If interested, I’ll do a write up on my Silvia mods once I’m happy with it. I had a quick look at this, and the code seems OK at first glance. The maximum value would be 2047 which only needs 11 bits to represent (since 2^11=2048), so that would be the 8 LSBs from packet1, and the 3 LSBs from packet0. The packet0 value is masked with 0xF8 which removes the top 5 bits, leaving only the 3 LSBs. Those are combined together to give an 11 bit value. Have you tried replacing the ‘raw’ value with 2047 in the code to see if it reports the maximum temperature? I’ll drop you an e-mail – if you send me your Python code, I could perhaps take a look and see if I can spot anything there? Re: the write up of the Silvia mods, I would love to see it! Congratulation for all this work! 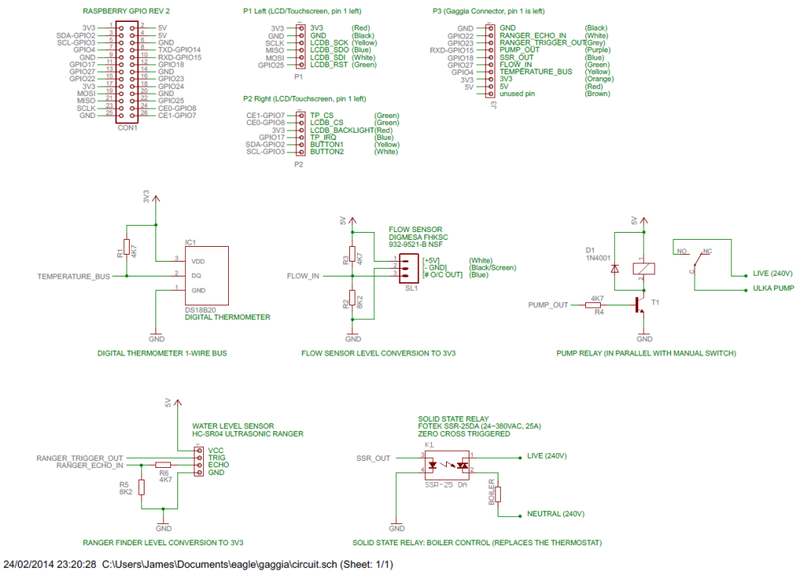 I came up on this blog while looking for a way to interface the TSIC 306 with a raspberry. The sensor will be integrated in an electric motor that drives a light electric vehicle (www.twike.com). As my main system is written in python (interface with the vehicle serial bus and other measurements) I am very interested in Graham post. Did you find a solution for the python implementation? I was thinking first to use your tsic.cpp and integrate it in my system via socket communication. However would be more happy with a full python code. Would you mind sharing it or giving me some advices on it? I just wanted to say this is a fantastic project and your documentation is very helpful. I’m planning a nano-brewery using my Raspberry PI and a lot of your espresso machine mods are quite similar to what I need to do, though probably not with as precise meausurements as I’ll be dealing with 5-10l of water instead of 30-60ml. I’m quite confident with the software side of things as I work as a software developer, but I’m a bit of a newbie with electronics so I’ll be taking it slow there. I’m more experienced at drinking beer than brewing it, but I can appreciate that there will be similarities in the software / hardware needed. Are you planning to write up/blog your project? Sounds really interesting! First of all thank you for sharing your ideas and methods! This has been really good to read while doing some modifications myself. So I am in the process of adding flow meter control to my NS Oscar with a simple Arduino board, and have a few observations that you may have made your self. Any way I would like to hear your comments. So the first thing I noticed was that the pump sounded very tired and supplied a lower flow than normally without the flow meter(with the comparison made without portafilter mounted). I suspect this is caused by the 1.2mm orifice of the digmesa sensor compared to the 2-3mm orifice of the ULKA pump, which will make the pump work harder with the flow sensor in place. Is this something that you have experienced? To begin with I was a bit worried by this, but as far as Google will tell me the 1.2mm digmesa and ULKA E* series pumps are a very common match. So I have decided to enjoy the strangled(/muffled) sounds of the ULKA and carry on. Have you tried to measure the signal from the flow meter? In the flow meter there are six impeller blades, but only two magnets. This should mean that the time with a low signal is longer that the time with a high signal, and hence it should be a bit more precise to only measure the rising or falling signal, not both. Is this something that you have considered? As Kahlid in the comments above, I too have got the correct volume without the portafilter mounted, and when I put in coffee I see the same drop in volume out of the machine. This makes sense… luckily. However, what are you doing to mitigate this? I can see in the code in github that you also dispense a fixed volume based on a calibration. I assume this calibration not has been performed with the filter and coffee inserted since ~230g of water would make a really bad espresso:-). My workaround to this issue is to measure the frequency of the incoming ticks from the flow meter, and then only to start counting ticks after the frequency has dropped below a certain limit (when the puck has been saturated and everything starts to be in some sort of steady state). This will require a calibration (with portafilter and coffee) of the number ticks needed to get the desired volume/weight of espresso. It will also require consistent dosing/grinding of the coffee to work, but it actually works quite nicely when that is fulfilled. The best solution I’ve seen to deal with this is what Breville does in their Dual Boiler (they don’t do this on their any of their other lower end machines). They have two flow meters: one mounted in the standard location before the pump, and another mounted on the low pressure output side of the OPV. That way, they’re able to account for water flowing out of the OPV, and subtract that from the input flow to get the actual flow through the grouphead. Interesting to know that Breville use two flow meters! It’s obviously a good technical solution, though perhaps surprising in a consumer product where they usually try to minimise part cost! It seems counter-intuitive that this should work (by creating such a closed circuit, you might expect the pressure to build up, or even flow backwards through the flow meter)… but it seems to work absolutely fine in practice. Ultimately, I was thinking that with an analogue pressure transducer and PWM modulation of the pump under closed loop control based on the pressure data, the mechanical OPV could potentially be eliminated completely (or perhaps set back to a high value, purely as an emergency pressure relief). The newer Breville machines (Infuser, DB, and Oracle) are fascinating to me because they are all clearly well designed and laid out, and they pay a lot of attention to the user experience. Unfortunately, despite generally positive reviews, it seems like they don’t get as much love from the community (or get taken seriously) owing to Breville being a general kitchen appliance manufacturer instead of a more niche brand associated with coffee machines. I did read about your solution to T the OPV output back to between the flow meter and pump input, but it is indeed counter intuitive to me that something like that would work; I had just incorrectly assumed that while better than no T, it would still be off somehow. Interesting to know that it works absolutely fine in practice – thanks! I agree that with closed loop control and a pressure transducer that the OPV can be used instead as a safety valve, but it seems like for that to produce consistent results, you’d also want to take flow into account as well. For example, one of the issues I’ve read about the La Marzocco Strada EP is that if your puck is channeling (or your grind is off etc) and putting up a lot less resistance than expected, the machine (being closed loop) would then ramp up the pump in order to achieve the set pressure, resulting in a fast gusher. Similarly, it seems like an OPV exists in designs based around the Ulka pump because when the pump is running at 9 bars, the flow rate is actually much higher than what would be desirable for espresso, so the OPV acts as an outlet for that extra flow to go. Having not done any testing myself, I wonder to what extent PWM has on the pump’s pressure:flow characteristics. I have a machine that uses a Fluid-o-Tech vibe pump with a different pressure to flow curve (closer to ideal espresso flow rates), and does away with the OPV entirely and instead simply has a flow restrictor in place to limit pressure. P.S. Rather humourously, I made the exact same mistake you made when I attempted to test the effects of the flyback diode – I, too neglected the series diode. Everything is fine aside from the shorted diode, and surprisingly my surge protector does not include any sort of fuse, so it blew out a PCB trace in the surge protection circuit instead. Will probably take another stab at it today. Sorry to hear about your blown diode – at least they are inexpensive, and you escaped unharmed. This reminds me, that I might build in a small fuse into the supply for the pump/solenoid/SSR branch, for future insurance against any mishaps. I’ve not noticed a big difference in the pump performance due to the restriction by the flow meter orifice, but what you say makes complete sense. This type of flow meter is very widely used in automatic and semi-automatic machines with the same Ulka EP pumps, and it seems to perform well. I notice that there’s a version of the flow meter with 2.0mm nozzle size available also, and the manufacturer gives the maximum flow rate (l/min) and pressure loss (bar) for each model. You make an interesting point about the flow meter pulse counting. My current software counts both rising/falling edge. Calibration was done by dispensing clean water (without coffee puck!) into a jug on a digital scale, and weighed the water volume dispensed. Your idea of only counting pulses when the frequency drops is an interesting approach. There is a lot of potential to analyse the flow and pressure sensor data to detect the point where the puck is fully saturated and it starts to dispense coffee and, at the other end of the scale, to prevent over extraction. I’ve only scratched the surface with what can be done in software so far. Most of my efforts have been on the hardware side to date, but I do plan to do some further work on the software when I can find some spare time! Curiously, despite having added the capability to dispense automatically, I still tend to use the manual switch at the moment, so I can keep an eye on the extraction! It would be helpful to indicate the particular version you have, and provide some photos of the machine – this would help people identify which machine you have. There are some wiring diagrams and drawings for most of the Gaggia machines in the library on the Gaggia User Group, so it would be worth taking a look there also. There are some really knowledgeable people on there, so it’s a great resource. If you are still stuck, do let me know of course and I’ll try and help. I am wondering how you physically implemented the ultrasonic range finder. Was mounted in the boiler? Was it pointed towards the water from the top? Any info on how this was done would be great! I used an HC-SR04 range finder, which I mounted in a very shallow plastic box with two circular holes drilled for the two transducers. It’s used the measure the water level in the reservoir (not the boiler). The range finder is mounted directly above the plastic water reservoir, flat against the steel panel, and pointing straight down at the surface of the water in the reservoir. Hope that helps? Let me know if you still have questions. I am planning on doing a similar project with my Rancilio Silvia in the next couple months. I’m planning on utilizing the Raspberry Pi 7-inch touch screen with the Raspberry Pi B+. I originally bought the 40 amp Fotek SSR on ebay to run the heating element, but decided against it after finding out they are counterfeit. Apparently they can only handle about half of their rated amperage before sticking on / melting. I ended up buying a used 25 amp SSR by Opto 22, which is supposed to be a better brand. For everything else (such as the pump, 3-way solenoid valve, etc), I am using a Sainsmart 4-channel SSR board that uses 4x 2-amp Omron solid state relays. I am definitely going to be using your blog post as a reference for my build since you go into so much detail and my project doesn’t vary too much from yours hardware-wise. Do you happen to have a blog post about how you go about tuning your PID settings? I’ve read a couple things online about different ways to tune a PID algorithm, but I’m curious to hear about what you did since I still don’t feel like I have a rock solid understanding of what I need to do. I do plan on documenting my project using a blog and/or Youtube videos, so I am hoping it’ll just be a few weeks to a month before I get that going (I’m waiting on a bunch of parts to come in for the build and some are back-ordered to February, so there is not much I can do, yet). Great – should be really nice with the 7″ touch-screen! Is that the official one? I’ve got one on order, but they are still out of stock..
I’ve been using a Fotek SSR-25 DA for over a year now, they seem reliable. Of course, at 240V UK mains, the current needed for the heating element will be lower (under 6A), so 25A is comfortably overrated. The main problem I’ve had is with Raspberry Pi SD cards being corrupted.. I’ve just had to reinstall my machine over Christmas. It is basically working again, but there are a couple of issues to resolve. I’ll be updating my Blog with the details of how to get it all working on Raspbian Jessie! Very much looking forward to seeing your project! Yes, it is the official one. Mine is still back-ordered as well. I’m hoping to get it late January or early February. Everything I’ve heard about the counterfeit Fotek SSRs is that they work absolutely fine as long as you don’t use more than half of their rated capability. 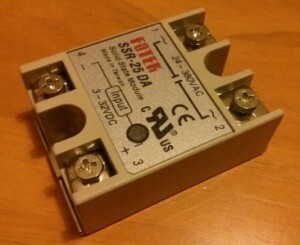 For example, I’ve heard that the triac inside of the 25 amp one is rated for 12 amps max. Any ideas on what is causing your SD card corruption? Is the number of writes just wearing out the card? I’m planning on tuning everything to minimize read/write IO on the card. The other thing I may end up doing is buying a bigger SD card since it utilizes wear leveling to prevent early failure. Of course, good backups are a must in the event of a complete failure (git will be useful for this). I’m looking forward to reading about your updated version using Raspbian Jessie! There are a few changes committed on Github also, to fix issues that appeared in the upgrade to Jessie (and to add some files I forgot to include originally). In the recent reinstall, I used a larger SD card, disabled swap, enabled noatime and nodiratime. However, it’s still writing temperature/pressure logs to the card every second, so quite a bit of SD card write activity. Another option I’ve considered is to make the SD card read only, and use a USB stick for the log files. I’d need to replace the Model A with the B+ as the A only has one USB port (currently used for WiFi). When it got corrupted, fortunately the contents of the SD card were still readable after running fsck from Ubuntu, so the files could be salvaged. I relied on my own notes from this Blog to reinstall it! Of course, there have been many changes to Raspbian over since I first set it up (e.g. device-tree overlays), so there were a few corresponding changes needed to get it running on Jessie. I’ve committed everything needed to Github so it’s all up to date again. Hi Nate, yes – this looks like it would be a really good candidate for the job! Page 3 says it can even tolerate 160C for “a short period” without physical damage 🙂 It would be quite easy to interface also. Good find! These details are great, and your build is amazing. I’ve had a pi 2 lying around for ages and just restored a Gaggia Classic to working order. My coding and electrical skills are very basic so I’m looking to start by implementing a PID only build and working on from that to add in flow control etc. 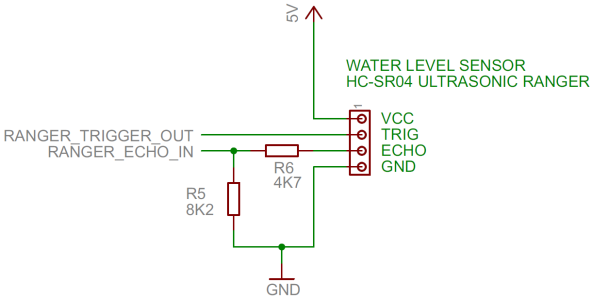 What parts would I need to begin beyond the Fotek SSR and the temperature sensor? Do you have a blog post from when you were at the initial stages? Apologies if I’ve just done a terrible job of looking. For basic PID control, all you really need are a suitable SSR and temperature sensor. I would recommend getting the temperature sensor working first (which you can obviously do outside the machine). Take care using the SSR, as mains voltages can kill. 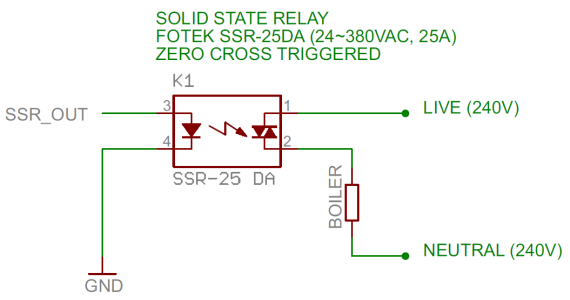 All the information I’ve written up is on this site, and there’s a circuit diagram / schematic showing how the SSR and temperature sensor and connected up. There are a few separate posts, so you could try the search function with “espresso” and that will probably pull them all up. If you have questions, drop me a line and I’ll try to help. Superb job! Thanks to your blog I’ve decided to do the Pi mod instead of just settling on a usual PID one..
Back a few years ago when Pi was about to start I was still coding in assembly for Microchip PIC’s… this all looks like a next level but I think I should be ok.
I’m just making a list of things to get started and would appreciate some help. Obviously need a Pi (B+? RS 811-1284), bits to make the thermostat replacement, display, what else? Were you buying majority of things from ebay? Hi, thanks for the kind words – it was a fun project! 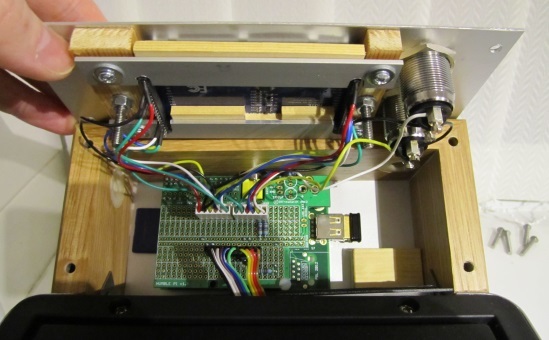 Any recent Pi model would be fine – this project doesn’t need a lot of computing power, but it uses a lot of GPIO pins. There are some really nice “off the shelf” display options for the Pi now like the Adafruit PiTFT. The other things I used were lots of insulated bullet and spade connectors, and also for the mains wiring I used silicone wire with a high temperature rating and suitable current rating. Most of the low voltage wiring is ribbon cable and 0.1″ crimp header connections. As always, be safe and take care with the mains voltages! I’m probably going to try to do it on a smallest possible budget so SSR from ebay will have to do.. I’ve read about counterfeit Fotek ones and haven’t found even one yet that would look like a genuine one lol. But generally they are overrated for what they have inside, so will just buy a 40Amp one hoping it’s going to be good up to 20Amp. For TFT I’m going for ebay again… hopefully integration will not be too bad. Anything to watch for there? Some decent looking kits with a case etc go for ~£10! I’ve been trying to find the flow meter you mentioned – there is plenty of similar ones out there. Does it make any difference to what I’d get? Tom (who commented below) mentioned in his post about having finer control with smaller nozzles but even 1.2mm seemed ok for a double which is what I always make. 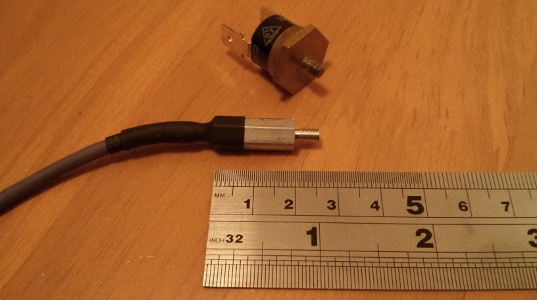 How much did your pressure sensor cost? These are normally pretty expensive and over £30 easily. I suspect my Fotek SSR 25A is a counterfeit, but it has proved reliable (been running every day for a good few years now). For the TFT if you send a link I’ll be happy to take a look. Looking back, I paid £24 for the pressure sensor, they are pretty expensive unfortunately. If you are plumbing in components, you also need to consider toxicity/corrosion, so ideally stainless steel & high temperature plastics. The pressure sensor isn’t essential of course & the main benefit of modifying your machine is to have more precise and stable temperature regulation. The flow sensor came from http://www.buyspares.co.uk and cost £9 including P&P back in 2013, it was a coffee machine spare part. The 1.2mm bore should be fine. I think the exact model number I used is on this blog somewhere (let me know otherwise), and has worked reliably over the last 3 years. Let me know if you need more help locating one. OK, thanks. I’ll keep an eye out for them in those places. I discovered your page whilst documenting my own Arduino-based project which I been working on for years. 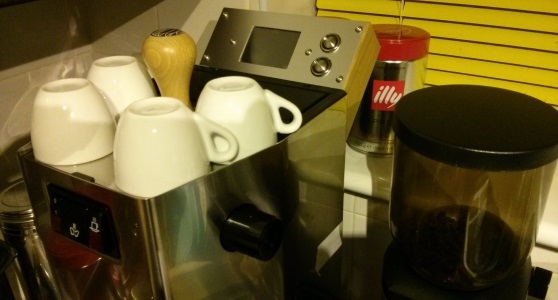 Nice to know there are others out there with the same passion for hardware, software and Gaggia coffee. I was particularly interested in your temp probe (nice trick to use a hex spacer). My own experimentation and calculations suggest that the built-in thermostat mounting points would have quite a high latency in responding to temperature changes (over 10 seconds). Do you find this? I also liked the IGBT idea for pump control. I use a triac and phase control (implemented my own SSRs with optocouples and triac which saves space and costs a lot less). I find the pump’s response is laggy and very non-linear, so controlling it required a lot of experimentation. Mind you, I control for flow, not pressure. You have me wondering whether it might be interesting to try PWM with an IGBT for comparison. Pleased to meet a fellow enthusiast! I had a quick look over your Arduino based controller from my ‘phone, and it looks like a really nice project – I’ll enjoy reading all the details later! Yes, temp probe inside the boiler is a large step too far for me too. One thing I must document is my temperature and flow control algorithms. PID (for temperature) takes far too long to stabilise because of the latency in temperature measurement. Inspired by model predictive control, my PID controller controls a model of the temperature which, over time, is updated by the actual read temperature. That way, the latency effect is pretty much eliminated. I live for the day when I can get the machine up to steady temperature throughout in less than two minutes. PID was useless for flow control, but I hit on another cunning trick there. I’ll have to go back and look at the source code to remind myself what it was! Sounds like an interesting approach you’ve used, I would be interested to know the details if you write it up. I’m sure further optimisation is possible. In my case, the boot up time of the Raspberry Pi extends the start up, as it has to boot Linux before it can even start the PID controller. That’s one delay you won’t have on Arduino of course. Anyway, your posts are inspiring me to tinker with my machine again so… when this early summer sunshine is replaced by the usual weekend rain, I will no doubt pick up my adjustable spanner and soldering iron again! Fantastic tutorial! Thanks for the time spent on documenting the whole process! Would you have any rough estimations of the total cost of this project? I have never done this type of modding before so am a pretty skeptical as whether I’d be able to achieve or not but really fancy trying it out. Thanks for a superb project. Have you looked at Radpberry Pi Zero? It is much smaller and has got 40 pins GPIO. You’re right – the Raspberry Pi Zero would be a really good choice for this project, and probably what I would use if starting from scratch. When the Zero first came out, I tried ordering one to play with, but they were sold out for weeks! Perhaps I’ll use one for my next project, now they’re easier to come by! I have a digimesa flowmeter identical to the one in the picture above. For testing purposes I have just isolated the pump and am going from tank -> digimesa -> pump -> out to measuring jug. I am finding that flow is measuring near perfect except for when I switch the pump off…then the last reading with positive flow gives on occasion (not every time) a completely erratic high reading e.g. average pulse count per second is 20 say and the last reading will be 80. I can think of two possible reasons: 1) the impeller is still moving due to back flow, or trapped air or something, or 2) it could be the back-EMF spike from the solenoid causing electrical interference (e.g. electrically inducing noise in the cable from your sensor, causing false triggering). To eliminate (2) I would suggest using good quality foil screened cable from the sensor, keeping the wiring short, and running it well away from the pump and other wiring (e.g. adjacent to the metal case). You could also try adding a snubber circuit to the pump. It could also be due to water draining back through the impeller I guess, which might be solved by changes to pipe routing and orientation. Is your flow meter mounted horizontally? 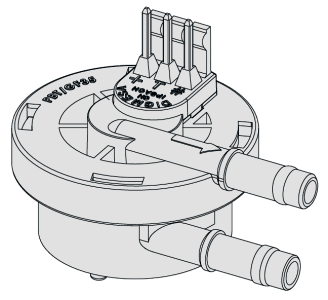 Mine is mounted as shown in the black and white picture above (with the inlet/outlet pipes horizontal, and the rotation axis of the impeller vertical. Thanks so much for getting back so quick. Yep ok that is really useful and gives me some pointers. At the moment I am running without the solenoid, boiler, grouphead etc literally just the pump and the flow meter….nothing else. I have it vertically (mainly because it won’t seem to stay horizontal!) so I think backflow/trapped air is the most likely cause, maybe made worse by position. It seems hard to get it to stay horizontal with the inlet outlet coming from the same side (I have the zero degree version as pictured)….but that’s what i’ll play with next (maybe it’ll help if I use the brass t-joint and more piping) and see if I can get it to behave. I’m pretty sure that it will work better in a horizontal orientation. To secure mine, I drilled a 4mm hole in a plastic bracket (part of a curtain rail! ), pushed the mounting stud of the sensor into the hole, and screwed the other end of the bracket to a hole in the chassis (using the hole left after removing the return pipe to the water tank). Incidentally, when I mentioned the possibility of it being back-EMF spikes from the solenoid, I actually meant the pump (i.e. I was thinking of the solenoid inside the pump, not the solenoid on the boiler). However, in your case it’s more likely due to the sensor being vertical. 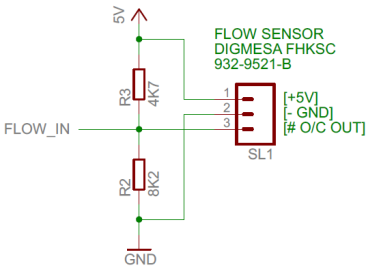 I also noticed some of the links in my article to the flow sensor datasheet were dead, so I’ve updated those above in case they help. I have read your blog with great interest and must say it is very well writen. I have been working on and designing espressso machines for the last 15 years from a mechanical point of view and was wondering if I could contact you directly about a current design project I am working on, with a view to getting some assistance or advice ? Certainly, I’ll e-mail you directly so we can discuss offline. 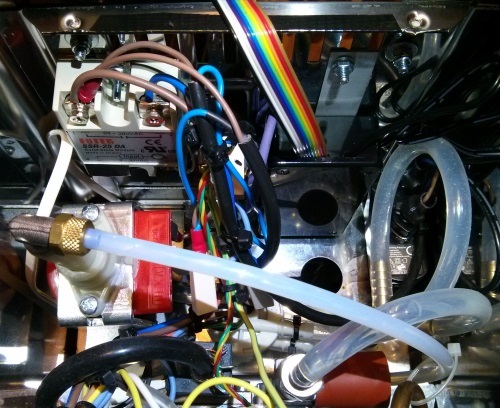 Do you have a complete parts list for the most current build of your PID controller for the Gaggia Classic? It makes ordering a lot easier rather than having to miss out a few items to then have to make a return trip or pay for additional delivery not to mention saving time. Or have I missed it in your blog? I was wondering how the power for the Pi is configured. I noticed you said its powered from the GPIO but couldn’t see where in the wiring diagrams. Have you posted this configuration anywhere on the blog? The best way to power the Pi is via the micro USB port. In my case, I was very limited for space, so I wired direct to the 5V and GND GPIO pins. I just did a quick Google and found a good explanation of the different options here (which includes photographs). Ah, I read it as the Pi is powered via the same power supply as the espresso machine but it still has its own separate supply just via GPIO instead of micro USB? 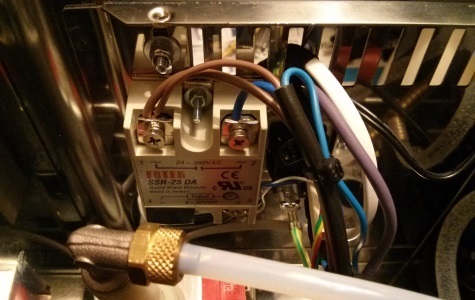 Yes, that’s right – I got a very small 5V mains power supply, installed it inside the machine, and wired it directly to the incoming mains Live and Neutral (after the Gaggia power switch). As soon as you power on the machine, it starts booting up. To shut it down cleanly, I press and hold “button 2” (the lower button in the picture at top of page) and it initiates a shutdown. Then I wait for it to shut down, before flicking the mains power switch to the off position. It would be nice to have some battery backup to enable the Pi to do this shutdown automatically! I was wondering what the reason was you didn’t include pwm control of the boiler steam temperature? Let me know if you can think of anything else or had other ideas in mind. For the steam temperature I can’t see why you can’t use the same temperature sensor and just add some code to also support steam PWM? I’m planning on adding another temperature sensor to replace the steam one anyway but I am not sure it’s necessary. There are a few reasons why I didn’t bother with PWM of steam temperature: 1) I only drink Espresso and very seldom make Cappuccino, 2) I assume temperature control is less critical for steaming, 3) my digital temperature sensor is at the limits of its range when steaming (this could be solved by a different sensor or additional thermocouple of course), 4) I wanted to leave the steam thermostat in place for safety (rather than relying only on the thermal fuse). 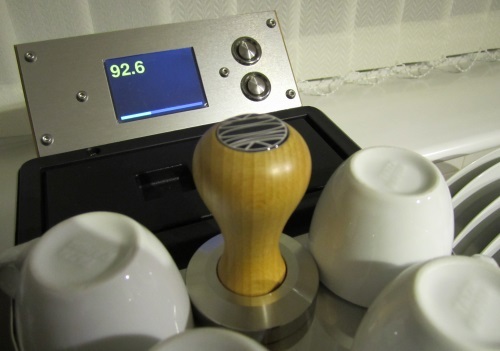 Accurate temperature control is absolutely critical for brewing good coffee of course! Thanks Kevin, glad you found it useful. 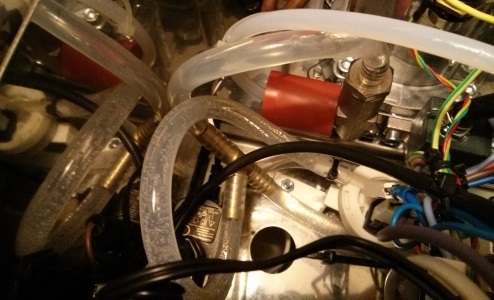 Your twin boiler project sounds intriguing – which donor machines are you using? I’m in the middle of a similar project using an Arduino and this has been invaluable! I’m curious as to whether you ever made much use of the pressure transducer? Also, where did you mount it? If, like me, you installed it on PTFE pump outlet line I would imagine it is very noisy and this would preclude using it in any feedback circuit. I have a plan to re-site mine to read boiler pressure by swapping the standard Classic steam valve for a Gaggia Evolution steam valve. (https://www.gaggia-parts.co.uk/Gaggia-Brass-Faucet-W-Self-Priming-Valve-Assy), stripping the valve out and using this connection for the pressure gauge(s). I’m only using it to display and log pressure, not currently for closed loop feedback control of pressure (although that was my original plan, I never got around to it). To mount the transducer, I split the PTFE pump outlet line with a push-fit equal tee, then connected the pressure transducer (Danfoss AKS 32R) there, as well as a 40mm analogue pressure gauge (I drilled through the front panel of the machine and mounted the gauge on the front panel). I fitted the pressure transducer with a “gauge snubber” to dampen the pulsations from the pump, and I’m also low pass filtering the measurements in software (simple moving average type filter). Will your pressure transducer be able to cope with the higher temperatures seen on the boiler? 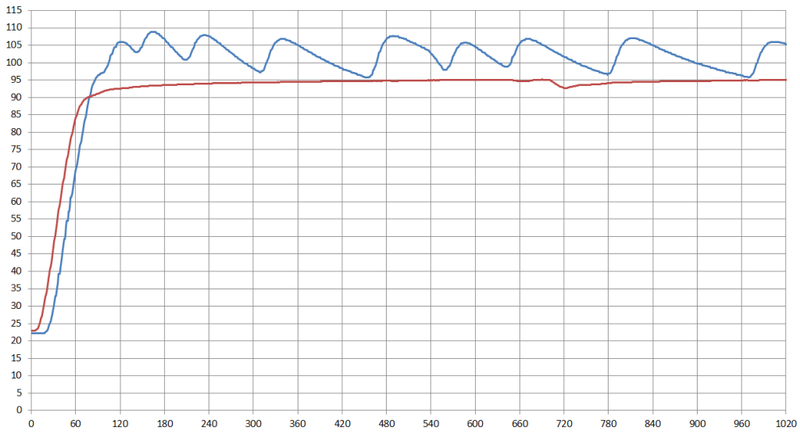 Francis, see the yellow graph here – it shows how much noise is created on a pressure transducer that is plugged directly into the PTFE line without snubber – this is a Gaggia Classic so it’s a 50ish W vibratory pump. Love this project and hope to recreate it myself. I had a question though. I am control engineer so really want to experiment with getting the best performance out of the controllers and trying different types of control. So I was wondering why you choose to not implement the fast pwm control you created for the pump in the temperature control as well? It seems to me that temperature control is more important. I’m sure there is a lot more that can be done to improve the performance of the controller on the software side, and would be interested to compare notes! Have you done any updates on this software to translate its use to a Raspberry Pi 3 B? I am okay with programming, but taking some of these older projects and implementing on the newer boards has been overwhelming for me as it seems there are a lot of places for things to go wrong. As far as I can see, it should “just work” – I can’t see that any changes would be needed. The Pi 3 is faster, with more USB ports, more memory and built in WiFi, but otherwise very similar. The PIGPIO library works on the Pi 3. In short, I don’t see any issue with it. If you should run into any problems, let me know and I will be happy to help. 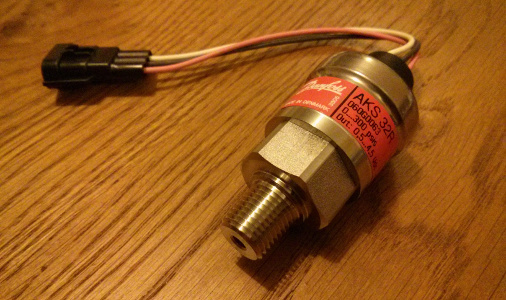 I’ve googled around as to where to buy a Danfoss AKS 32R pressure sensor and the only places that have it available list it for well over $100. Where and how much did you buy yours for? I went ahead and bought the silver looking one off of ebay for $12… Hopefully it’s accurate. Mine was purchased second hand from eBay (it was listed as a spare part that had never been used), therefore much cheaper than list price. I can’t remember how much I paid for it, but I think less than $20. It was back in 2013/14 and my memory is hazy. If I had to buy one new at full price, I’d probably do the same as you and get one of the cheaper clones off eBay. Is yours stainless steel?